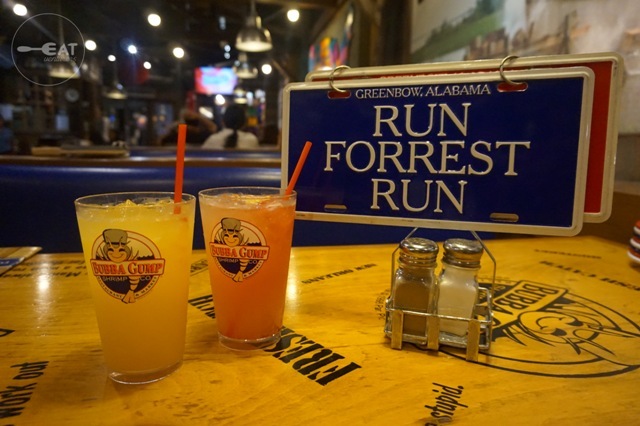 There's definitely a reason why Bubba Gump has been in Greenbelt for years. The Eatventurers tried it for the first time and we had an idea why. 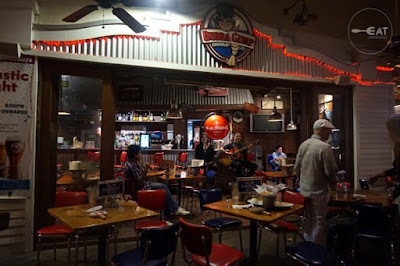 Bubba Gump is initially a small chain of seafood restaurants "committed to providing a casual environment where everyone can enjoy a great meal and have fun" in the United States, until it branched out internationally. Its sole branch in Greenbelt 3, Makati City has been a testament of its legacy. 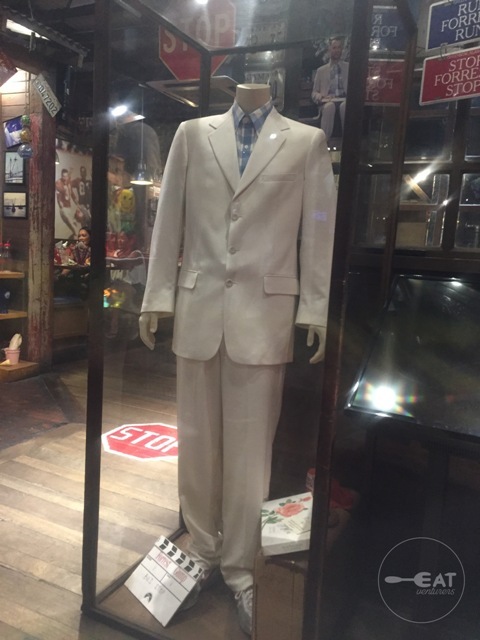 If you think you've heard of it before, that's because it is inspired by the classic 1994 film Forrest Gump. 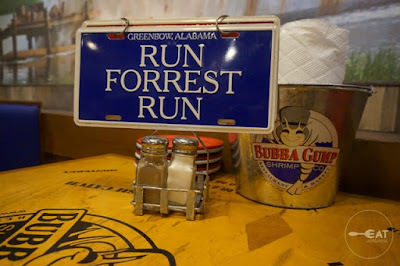 The restaurant is named after the film's characters: "Bubba" Blue and Forrest "Gump." 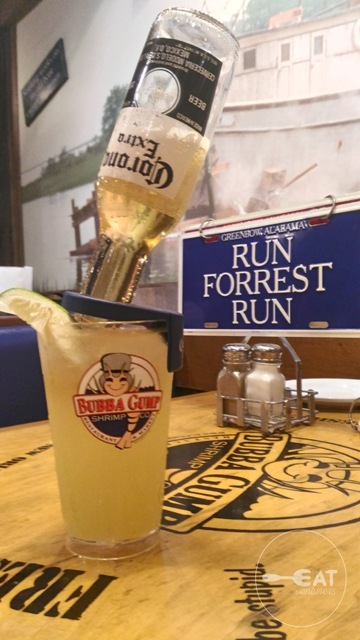 Bubba suggested that Forrest should open a shrimp business, and Forrest eventually pursued the idea after Bubba's death in the Vietnam War. Here's our review on our first visit at Bubba Gump. 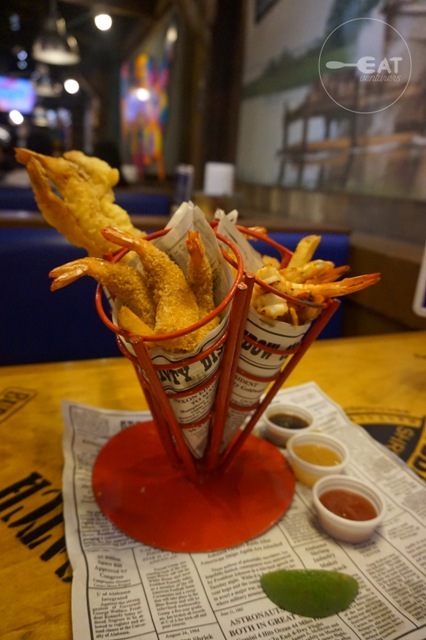 If you are craving for shrimp, they have these and more at Bubba Gump. We ordered: Shrimper's Heaven (P870), Yin Yang Salad (P495), Dixie Fishwich (P335), and Dixie Style Baby Back Ribs (P995). For drinks: Mango Lemon-Up (P290) and Strawberry Lemon-Up (P290). For desserts: Chocolate Chip Cookie Sundae (P380) and Alabama Mud Pie (P385). The prices of their food and drinks are quite expensive but most of their dishes are already good for sharing. 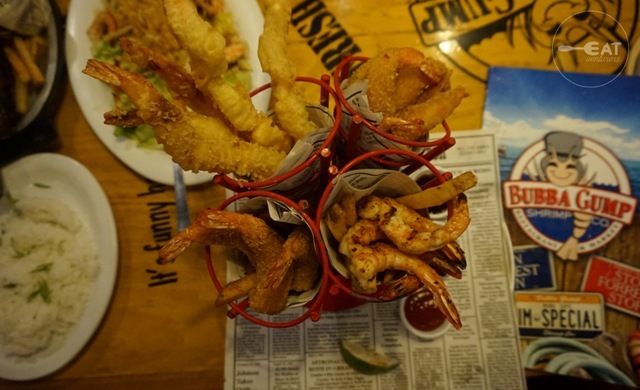 If you are a shrimp-lover you'll definitely love Shrimper's Heaven. Munch these goodness with your friends and family! Four varieties of shrimp can be found in this dish. 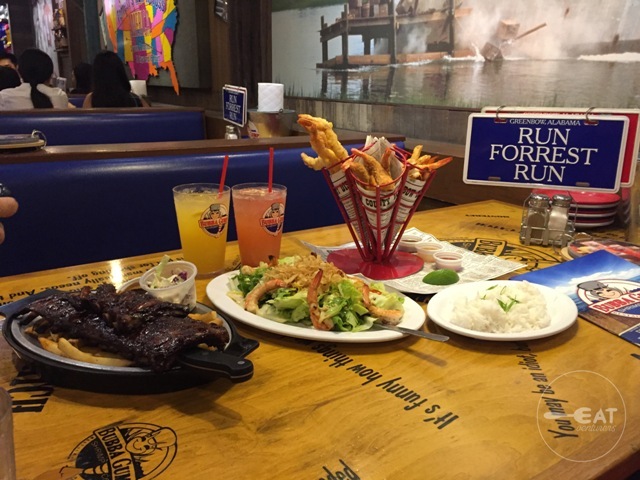 Choose your favorite: Hand Breaded Coconut Shrimp, Grilled Shrimp, Fried Shrimp, and Japanese-style Tempura Shrimp. It is served with fries and three Dippin' Sauces: Tangy Asian, Cajun Marmalade, and Zesty Cocktail. You can also squeeze lime on your shrimp if you prefer. On the other hand, we were impressed with their Yin Yang Shrimp Salad. It didn't look too appetizing but we were surprised when we took our first bite. The greens were still fresh and crunchy and they were well-coated with their Asian Wasabi dressing. Don't be intimidated with the word wasabi for it isn't spicy. 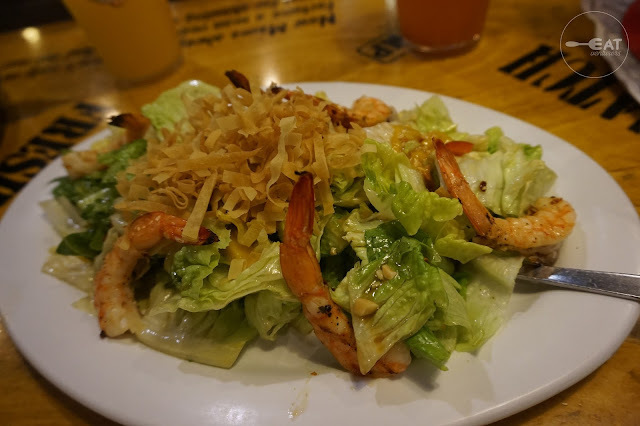 The crispy wonton strips and peanuts provided additional crunch and texture, while the mangoes gave the salad a more refreshing taste. Let's not forget it is also topped with shrimp! Or you can also choose chicken if you are allergic to shrimp. If you are particular with your health, this is for you. For vegetarians, you can request for no meat. 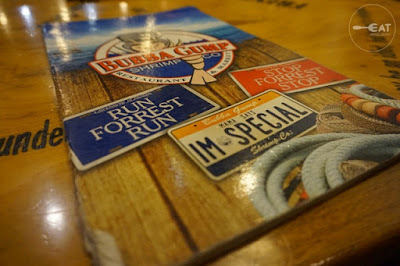 Next is Bubba Gump's Dixie Fishwich. You can have the fish grilled, but we got 'em fried. The fish was crunchy and well-seasoned. With the Louisiana special sauce and cheese, it is a dish you will crave for. 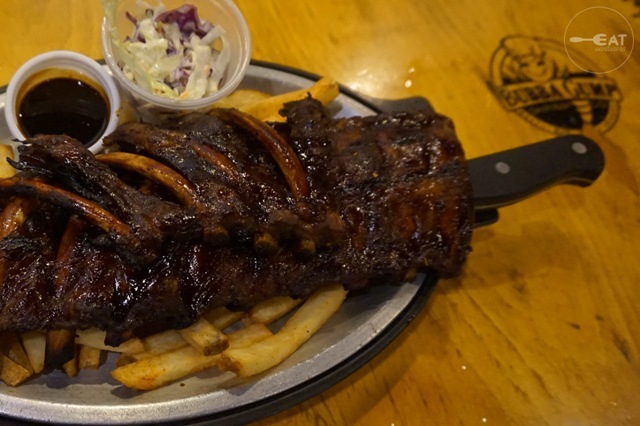 As if the above mentioned dishes weren't enough, here goes their Dixie Style Baby Back Ribs. It is your usual rub, more on the sweet side. It has that classic smoky and charred taste, a little bit dark because of the sugar. 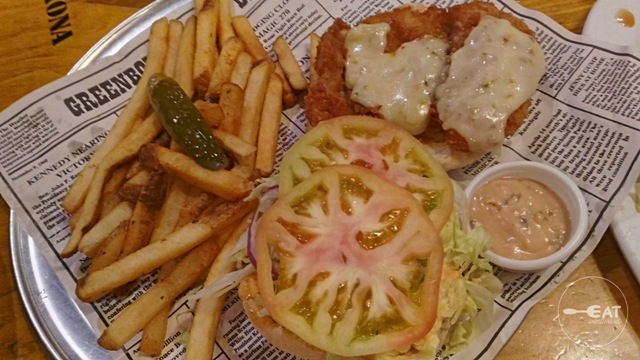 It is served with fries, coleslaw, and barbecue sauce. It is good for two, or up to four persons already. The lemon-up drinks however, were way too expensive. There is nothing special about them. Finally, let's talk about their desserts. These surprised us a lot. 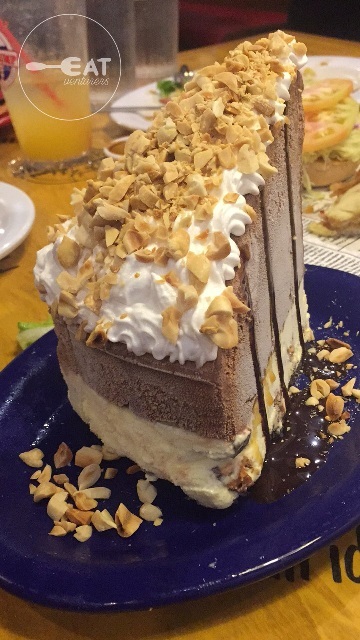 If you want some ice cream, look no further as you can order their Alabama Mud Pie. It has a huge serving, very good to share with the whole family. It looks like a ball, cut into two, and sliced like a cake. The layers are pretty amazing. You'll have chocolate ice cream, vanilla ice cream, caramel, chocolate syrup, and a generous amount of crunchy peanuts with a hard chocolate bottom. Their Chocolate Chip Cookie Sundae (cookies) are to die for. It seemed like a hybrid of a cookie and a muffin. It tasted really good and it is freshly baked just for you! Expect it to be hot, chewy, and moist in the center. And oh, they also offer alcoholic drinks perfect for your dinnerinks. For their service, we advise you to have little patience when you are ordering and getting your bill. Admittedly, they are still improving their service at the moment. We are sure though they can fix it in no time. 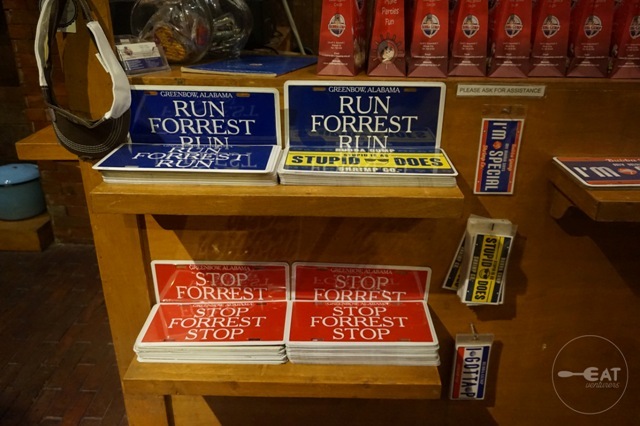 We forgot to mention that since it is a franchise from the US, Bubba Gump also offers souvenir merchandise. 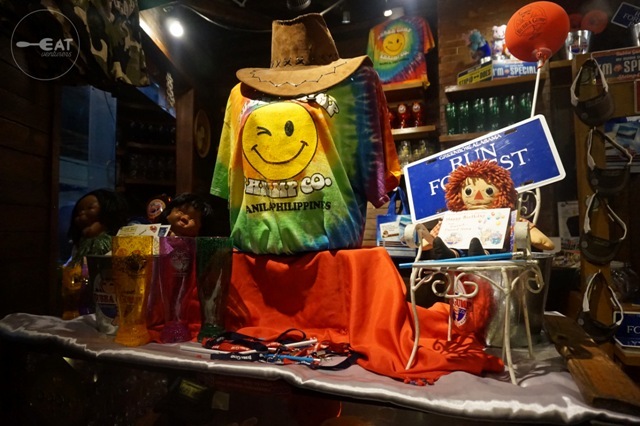 From glasses, to shirts, to stuff toys, to plates they have it here. 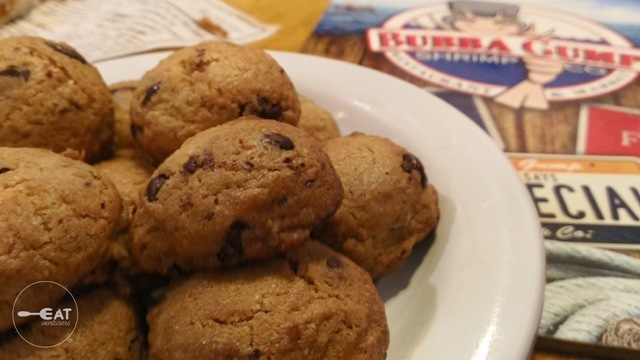 13 years and three owners later, Bubba Gump boasts that the quality of their food remains the same. 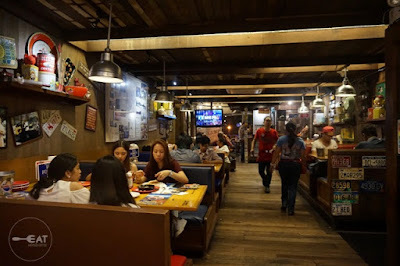 It has become one of the iconic restaurants of Greenbelt, Ayala Malls. The place created a lot of memories among their loyal followers. Gather your loved ones and RUN to Bubba Gump! 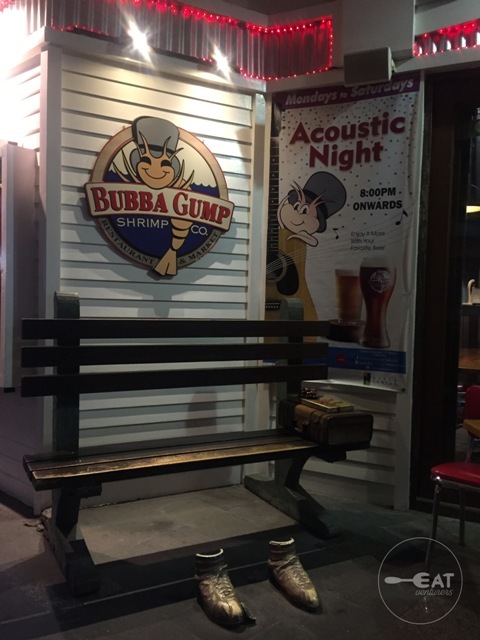 With that we leave you with a famous quote from Forrest Gump also applicable to Bubba Gump: "Life is like a box of chocolates, you never know what you're gonna get."